One of our favorite shows, Chopped, knows that summertime is grilling time. Their new series Chopped Grill Masters pits (pun intended) chefs against one another as they grill outdoors in boiling temperatures. If you grill, or aspire to grill, the series can’t be missed! We recently reached out to one of the contestants on the very first episode, Chef Galen Zamarra (@galenzamarra) to learn more about how he cooks without the kitchen. FP: How did you get your start with cooking? When did you decide you wanted to be a chef? What do you enjoy most about being a chef? GZ: I started cooking in high school, and even took classes when I was 13 at a local community college. I knew I wanted to work in a restaurant around 13 or 14 years old. My first job was in a sandwich place, and then I got a job at a small fine dining restaurant making apps and desserts. Eventually I went to the CIA for culinary school. I love to challenge myself as a chef to learn new things and make new dishes. I feel like every day there is more to learn, and that is what I love best about my job. FP: Both of your restaurants Mas (la grillade & Farmhouse) are highly regarded for their use of local and sustainable ingredients. Tell us how the concept of Mas evolved. GZ: A ‘mas’ is a small farmhouse or cottage in France. When we opened Mas (Farmhouse) eight years ago, we wanted a fine dining restaurant with great food that came from the surrounding lands, farms and waters. Last year, I wanted to take the farm to table and ingredient driven approach I had at the Farmhouse and take it to another level by simplifying the cooking technique. So I decided cooing over wood fire was the best way to do that. FP: It’s great to hear how much you value local ingredients. Fresh tastes best! Name some of your favorite chefs and why. GZ: Daniel Boloud is a chef I have grown to respect more and more recently. He has opened many different restaurants now, and they are all good and unique. I am really in awe of how he maintains such a high level of quality and consistency at all of them. I had the honor of working at Michel Bras in France years ago. Beyond loving his food, he showed me that a chef can stay dedicated to his craft, and still have a life and family, something very important to me. David Bouley was a huge influence to me. I spent eight years in his kitchen and really grew up there. FP: Tell us about your experience on Chopped Grill Masters from casting to filming. What was it like to compete with the other chefs? Were you surprised with their decision? Would you do it again? GZ: I didn’t know what to expect from Chopped Grill Masters. We filmed the first episode, so it wasn’t like we could compare past episodes or anything. When they originally asked me to do it, I thought one of my sous chefs would be better suited for it, as Chopped usually doesn’t have established chefs on the show. But they wanted that for this episode. I thought it would be a good way to showcase my different approach to grilling, something I want Americans in general to see, that grills aren’t just for burgers and hotdogs. The filming was a jammed into a long day, from 6am until almost midnight. Most of it is scripted and for quick sound bites and shots that don’t have to do with the actual competition. I didn’t know who any of the other chefs were, or what type of chefs they would be, BBQ pit masters, restaurant chefs, etc. We weren’t able to see the kitchen until just before we started either, so that was another element of surprise to the whole competition. I have to admit, I was disappointed with the kitchen. I really wanted an awesome set up with some great wood fired grills and equipment. Instead we had a charcoal Weber, a gas grill, and smokers that never really were working when you wanted them. The other chefs were great, we all seemed to have a good time together and have fun competing. Quite honestly, I was surprised by the decision. Beyond the fact that I liked my dishes, I felt like I really made an effort to utilize the grills and smokers more than the other chefs, and I utilized the basket ingredients as the main elements of the dishes better. The show was about challenging myself, and I was happy with what I put out, win or lose. It was a fun experience. I wouldn’t do Chopped again, but others competitions or shows I wouldn’t say no to. You wouldn’t know it from the show but it was all high fives and hugs between us. I guess that makes for bad TV because the producers wanted more trash talk. They probably spent five hours off camera taping that sort of sound overs. GZ: I have a nice big barrel grill in my backyard, and I love cooking on it. I like cooking outside, and eating outside. Recently we cooked a huge pot of mussels for a group of friends and had that with grilled bread and beer, or a crawfish boil. My wife loves fried chicken and champagne, which has become a sort of tradition for us. I also enjoy hunting, so I love to cook game. I rarely eat out much. I don’t get to eat with my family very often, so when I have a day off I like to eat at home. I have an out of control sweet tooth so some of my guilty pleasures are cookies, candy bars, ice cream etc. I need to get a hold of it though. FP: Cookies and ice cream are so hard to resist, aren’t they? What is the MUST HAVE item every chef should have in his or her kitchen? GZ: Every chef should be able to sharpen their own knife, and then keep their knives sharp. Can’t stress that enough. I see too many chefs buying the most expensive knife on the market, but they can’t care for it and it breaks my heart. FP: If you hadn’t become a chef, what would you be doing? What are some of your non-cooking hobbies? GZ: If I was good at baseball, I wish I could be a baseball player. I also considered being a marine biologist as a kid and still love that. My hobbies are hunting, fly fishing, skiing, biking and gardening. FP: We’re huge baseball fans ourselves! Any advice for novice chefs? GZ: Try not to use recipes. I rarely do. Cooking should be very free. Cooks need to look at the food and understand what is happening in the cooking process. When you can cook like that, creating dishes becomes second nature. FP: That’s great advice! Thanks for your time, Chef Galen. We hope to come visit you at Mas sometime soon. Please keep us posted on your cooking ventures; we wish you continued success! 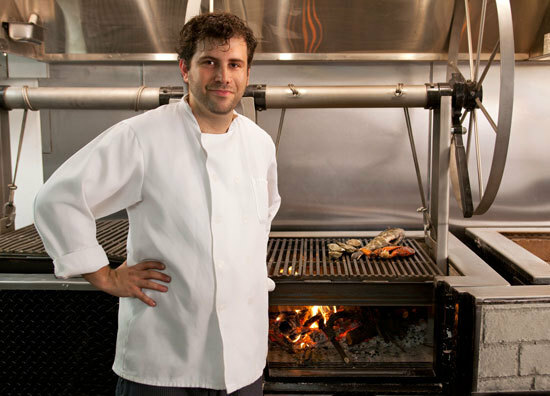 To learn more about Chef Galen’s farm fresh approach to food, visit Mas and Mas (la grillade).